Playing live dealer blackjack tables puts you in front of the world’s most popular card-based casino game with real, human dealers. Blackjack gets a lot of attention because of the stories of card counters being able to beat the house with a tremendous amount of skill. It’s common knowledge that these techniques cannot be used in regular online games because the deck or shoe is shuffled after each hand, and card counting and other related techniques require that a shoe is used that deals out several hands before reshuffling. In the case of live dealer blackjack games, you have an opportunity to get games that meet these requisites straight from your computer or mobile device. Multi-deck blackjack games are almost always what are used because of the ability to use a shoe to cut down on shuffling times. This usually involves eight decks. You won’t find many live dealer blackjack tables that pay 2:1 for blackjack. Instead, you’ll usually get a 3:2 payout, which is much better than the 6:5 you’ll often find in brick-and-mortar games. Splitting is generally limited to just one time per hand. This is due to the limited space for the format of the games themselves. Surrendering is virtually never an option at these tables. Aside from these particulars, the rules that you can find can vary quite a bit. This means you’ll want to take a look at what the exact rules are for any given table before you start, even if you’ve played with it before, so that you can make sure you’re prepared to make adjustments from a strategic point of view. A big part of the live dealer casino experience that you miss out on when you play regular online games is the social interaction with the dealer and your fellow players. With live blackjack online, you’ll get an opportunity to chat it up, tip your dealer and do everything else you normally would if you were playing in a brick-and-mortar game. This is a big deal because the social aspect of blackjack is really huge, and many people don’t really like regular online tables because of the inability to meet people and talk about how the hands are going. As we mentioned up above, live dealer blackjack tables offer a chance for card counting, which is a way that highly skilled players can get an advantage against the casino in different situations. It’s impossible to do unless you have a game with a shoe where several hands are dealt before a reshuffle, and that’s the case with almost all live dealer options for blackjack. The statistic that matters the most for card counters is the idea of “penetration,” which is how far into the shoe the dealer goes until the cards are reshuffled or a new shoe is brought in to deal from. This is taken as a percentage of the shoe, so if dealers went until three-fourths of the shoe had been dealt, then it would be said to have a penetration of 75 percent. In almost all live dealer blackjack games, you’ll have a penetration of around 50 percent. This is not ideal for card counters since a deeper penetration is preferred, but it does offer opportunities for skilled blackjack players to get the house advantage down even lower and to find some spots where they may have an advantage against the house. There are a few options for play with online live dealer tables that you won’t get when you play in brick-and-mortar or traditional online blackjack games, and these options really add a different level of depth to what’s available. One atypical option is that you have the ability to simply bet along with another player’s actions. You get to choose your own bet size, but you’ll make a hit, stand, double, split, etc. as the other player would playing his or her own hand. You’ll get the same result of winning or losing as that player, but you don’t have to actually play out the hands. This is very useful if you aren’t necessarily as comfortable with the strategic aspect of blackjack because if you see another player who is doing well, you can ride their wins and losses for yourself. Another option that changes up the game a bit is that you can jump in and out of games whenever you want. You don’t have to start at the beginning of a shoe like you would in brick-and-mortar games a lot of the time, but the action still carries on if you aren’t playing, which is different than how things go with typical online games. Live dealer blackjack tables use a shoe that has an actual penetration instead of reshuffling the deck after every hand like regular online games. The social atmosphere of the live blackjack tables is substantial while it’s completely missing for typical online play. You have a more narrow set of available rules with live tables because they’re all multi-deck games with similar rule sets, but traditional online games give you more of a variety of different styles of play. 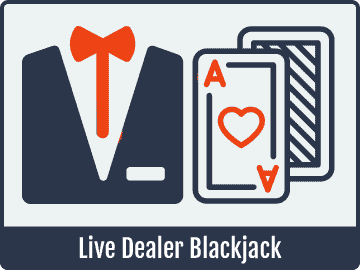 Blackjack is one of the games that benefits the most from having live dealer tables available. It adds a social element to what’s available, and it offers an experience that’s almost identical to brick-and-mortar games with extra options added on. Overall, it’s a great way to play if you love the game, and it offers an experience that combines the best of traditional live venues and the typical online environment.